S.E. 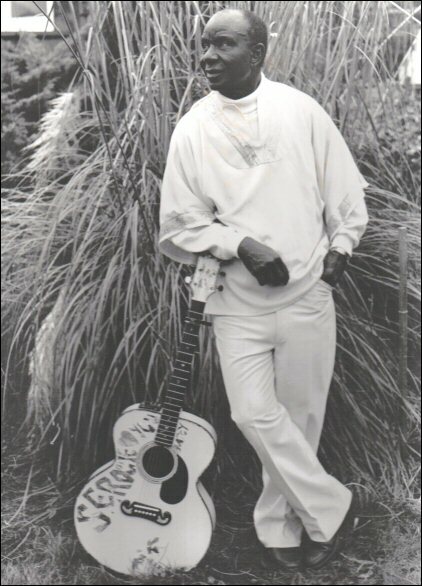 Rogie, (Sooliman Rogers) was born in the 1940s in Sierra Leone where he learned to play guitar while still a youngster. He grew up during the formative years of highlife and his palm wine style of playing fit right into the genre. He supported himself as tailor but by the 60s he was ready to go out as a musician on his own. Singing in four languages his songs, ‘Go Easy With Me’, and Koneh Pehlawo’ were big hits. But his biggest hit was the song ‘My Lovely Elizabeth’ which was covered by countless artists and is still know all along the West Coast of Africa. The song was eventually picked up by EMI and that led to a great advancement in his music and in his recordings. In 1965 Rogie formed a band, the Morningstars, who acompanied his acoustic guitar with electric intruments and the local sounds of African percussion. In 1967 he traveled to Liberia, and in 1970 he began the first of sixteen years in the U.S. performing his African Folk and Cultural Programs in Elementary and High Schools all over California. He received awards from the United States Congress and Senate, the City of Oakland, and the City of Berkeley. In 1988 he returned to his homeland. He died in 1994, just after his release of the album, Dead Men Don’t Smoke Marijuana. This entry was posted on November 24, 2015 at 2:26 pm and is filed under African, blogs. You can follow any responses to this entry through the RSS 2.0 feed. You can leave a response, or trackback from your own site.